I'm making the text of part one of The New Jefferson Bible available for free. Since the Open English Bible is available under a Creative Commons Zero license, it seems the decent thing to do. The second part of the book, the Marshall Edit, is not included in this file, since that is a unique creation of the Jesus story using Jefferson's intent of removing supernatural elements (though my own definition of supernatural). 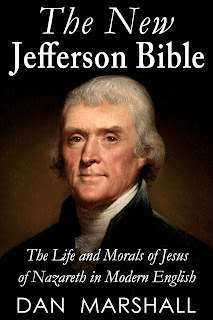 Below is the text of part one of The New Jefferson Bible: The Life and Morals of Jesus of Nazareth in Modern English, selected by Thomas Jefferson and compiled by Dan Marshall using the OEB translation. An ebook version is available from the Amazon, Barnes & Noble, or Kobo bookstores. You can also order a paperback copy from Amazon or Barnes & Noble. Click here to download the PDF of part one. Giveaway ends August 14, 2013. 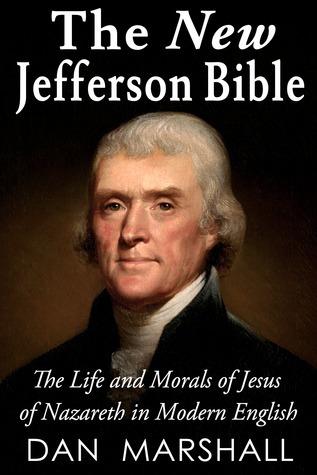 It seems Jefferson could not accept the more mythical aspects of the Jesus story, and produced The Life and Morals of Jesus of Nazareth as a means to reconcile what he saw as clear moral lessons to the reason and realism that dictated his relationship with the world. I believe he did literally what many do intellectually. Though few would sit down with a bible and a razor, most already choose the parts of the bible that best reflect their own ideals, or in many cases the ideals handed down by their ancestors. Tradition is a powerful thing, enough so that Jefferson did not want this work published during his lifetime. Whether this stemmed from a desire to maintain religious privacy or knowledge that some would consider what he'd done an offense punishable by death we'll never know. As an agnostic atheist, I was surprised by the amount of supernatural references left in the Jefferson Bible. While definitely more grounded than the original gospels, many of Jesus' moral lessons essentially boil down to "humble yourselves now for reward in Heaven", a somewhat disconcerting quid pro quo arrangement for someone such as myself who does not believe in an afterlife. While I know my evangelical friends would be quick to remind me that I am saved by grace, not by acts, I can truthfully say that since becoming an atheist I've never done something for hope of any sort of eternal reward. I have been an atheist for almost 15 years now, and I have done good things. I don't talk about them often, but I try to help people when I can. I do it because I have needed help before, and I believe that we owe one another the benefit of support. Everyone has a different opinion about the Jesus story. Some believe he never even existed. While I am not in that camp, I do believe his message was hijacked, first by Paul and then by the authorities of a burgeoning church, and was intentionally misrepresented to allow the same sort of people who were Pharisees in Jesus' day to remain in control. How much money is wrapped up in religion? I found out when I tried to reproduce the Jefferson Bible in modern style. Virtually all of the modern translations are copyrighted and have fairly strict use guidelines, enough so that making The New Jefferson Bible would have been impossible were it not for the Open English Bible translation. The terms of this translation are so open it might as well be public domain. I owe them a debt of gratitude for making this work possible. Had it not been for them, I would have had to choose between translations old enough to be public domain, many of which do not read well, or risking legal trouble by using a translation without permission. I am glad I did not have to make that choice. Lastly, regarding the Marshall edit that comprises the second part of the book: It is not my intention to attempt to position myself as an intellectual equal to Jefferson. His was done in Greek, Latin, French, and English. I could not begin to truly replicate his work. I think that what he did with this edit was important, because it does make the message of Jesus more accessible by removing supernatural aspects some would find problematic. All I have done is continue in that tradition by making it accessible in regards to the language used, and with my own edit I have removed the verse numbers and ordered the sentences into paragraphs. It is my hope that this formatting will make the work read more like a story. Perhaps the definition of supernatural has changed since Jefferson's time, but I removed many references to Heaven and god's wrath, as I don't find these to be a compelling reward or punishment. What remains is a story about a man who defied the religious authorities of his time and angered many people, enough so that he was eventually put to death. I find it to be an interesting read. I hope you enjoy The New Jefferson Bible: The Life and Morals of Jesus of Nazareth in Modern English. To read more about Thomas Jefferson and his religious views, click here. Dan Marshall is the author of the dystopian speculative fiction novel The Lightcap and an updated copy of the Jefferson Bible titled The New Jefferson Bible: The Life and Morals of Jesus of Nazareth in Modern English. Available through Amazon and other outlets. See www.amzn.to/danmarshall for a list of works. ©2014 Prose City Books. Simple theme. Theme images by luoman. Powered by Blogger.